Wendy Tyson’s Deadly Assets unfolds like a symphony. The opening chapters set the tone and every successive page, chapter, and clue increase the overall drama and intensity. Finally, as sleuth Allison Campbell plays all the once discordant notes in their proper key and arrangement, a crescendo of action erupts. Who would have thought that the work of an image consultant would be so deadly and so dangerous? 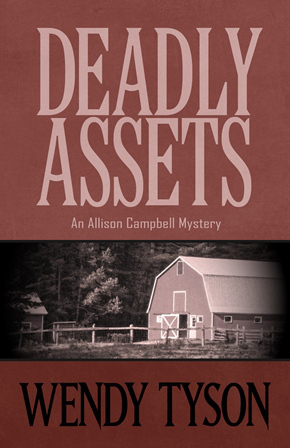 Deadly Assets is the second Allison Campbell mystery, but my first introduction to the character, series, and author. Wendy Tyson has crafted an enigmatic mystery plot that weaves together long buried secrets, corporate foul play, and two seemingly unrelated disappearances. More suspense/thriller than cozy mystery (my favorite of the mystery genres), I found myself missing the heavy helping of hear that I always find in the cozy corner of the mystery genre. That said, I did enjoy Deadly Assets. I found myself trying to puzzle out all of the plot lines as I made my morning coffee or waited for photocopies to finish printing while at The Day Job. To me, that’s a good sign – when I find myself still absorbed even when the book is not currently open or even in hand. Disclaimer: I was provided with a free advance copy of this book in exchange for my honest thoughts and review.